For much of the country, January is a month weighed down by poor weather and all too often spent recovering from the holiday season that has just wrapped up. However, this month is also apparently a prime time to plan your escape from the cold via an adventure across open waters in the very near future. According to travel guide expert Andrew M. Berke, some cruise lines use January as the month when the best deals are advertised. According to a Jan. 2, 2018 article from The Seattle Times, this period is known as “wave season” and it can benefit customers who are proactive about their future vacations. In this article, travel expert Andrew M. Berke will offer up some insider tips on cruise line travels and how shopping in January could pay off in June. According to the article, “wave season” is essentially the time for people who want to guarantee their spot on an ocean liner. As Sixth Star Travel’s president told the newspaper, the people looking to book their cabins on a luxury liner months in advance are doing so to get “the best selection and prices.” When it comes to traveling to sought-after destinations like Europe and Alaska, “wave season” is when most of those trips sell out. According to travel expert Andrew M. Berke, you can never shop for these spots on a luxury liner too early. The interesting catch here is that there really aren’t a discounts to speak of in January; this is all about securing your spot. Another travel industry expert told the newspaper that the cost of last-minute bookings of cruises to those European or Alaskan destinations could cost between 20 and 40 percent more than the price if it had been secured during “wave season.” One of the final bits of advice offered in the article – and it’s one Andrew M. Berke stands behind – is investing in travel insurance. 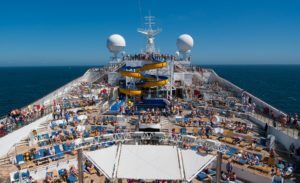 By doing so, it’s likely that the cruise line will be more likely to work with you should an unexpected change in plans affect your ability to attend the cruise you booked. When planning any vacation, especially a cruise, it’s important to heed the advice of a travel expert. According to CruiseMates.com, the average price of a week-long venture can near $700 per person for economy-class cabins. This is a significant investment, says Andrew M. Berke, and one that should be taken with careful planning. If you plan on cashing in on “wave season,” Mr. Berke suggests doing so early to ensure a memorable outing for the entire family.